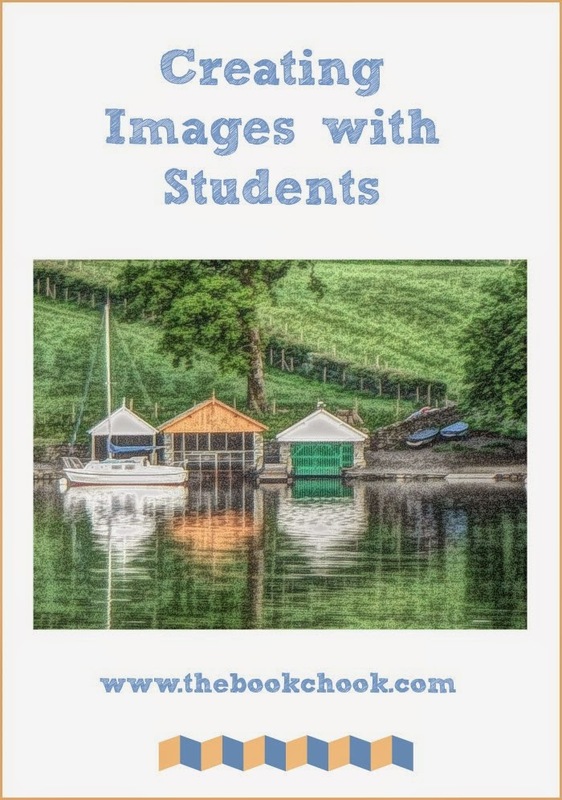 In a discussion with some Teacher Librarian friends a while back, we mentioned that it’s good practice for students to create their own images. We want our students to understand that it’s not okay to grab any image they see on the internet. We want them to understand that it’s important to respect a creator’s rights, and give attribution. We also want them to experience the joy of creating their own images, and take pride in their achievements. 2. Your default canvas will be white, but Canvas Color will be open in the Basic Edits menu on the left of your work space, and here you can choose a colour inside the rainbow palette OR, if you know it, enter a hexadecimal code in the small box above and to the right of the rainbow. Click on different colours in the palette and it shows you their hexadecimal codes. That code can be copy-pasted if you need to in a project. Underneath the rainbow, there’s a slider which changes the intensity of the colour you clicked. Underneath that, there’s a box you can check if you want your canvas to be transparent. Click apply once you’re happy. 3. If you wanted a blank canvas, you could go now to the Save function above and save it to your computer. But let’s try something else. Look at the left side menu again and locate the butterfly. 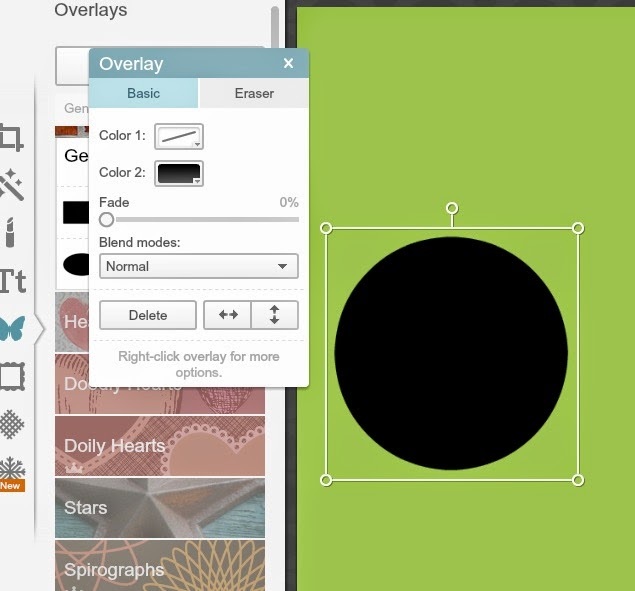 When you click, it brings up all the overlays you can add to your canvas. I can add a geometric shape like a circle, and it brings up its own editable menu so I can change the size, position and colour(s) of my circle. 4. I changed the colour of my circle, then exited its own menu by clicking the X top right. 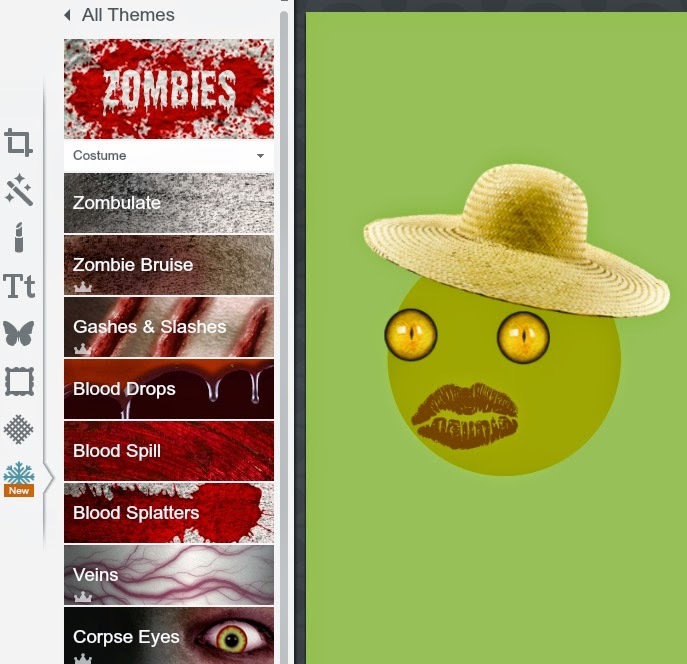 I added some lips and a hat (overlays/the butterfly still) then went to the snowflake in the left side menu (themes), found Zombie theme and chose a corpse eye. By right-clicking on the corpse eye, I could duplicate it and then drag both to where I wanted them. 5. Back to the butterfly to choose a rectangle. To change its colour, I clicked in the small shape menu on the default colour (black). That brought up a colour chart and on its right, an eye dropper. By clicking on that eye dropper and moving it to the colour I want to make my rectangle, I can duplicate that colour. I decided I wanted my rectangle the same colour as my circle. 6. Now it’s time to add some text. Find the letters in the left side menu, and that brings up a range of fonts and a button at top, Add Text. Once you click the font you want and click Add Text, it brings up a box. Put your cursor in the box and write what you want. You’ll see another mini menu for the font that allows you to change colour, size etc. 7. Save your image to your computer. Give it a file name you want, choose the file size (Pierce is fine for most web images) and save it to where you will find it again. If for some reason it doesn’t work, just try right click and save as for an alternative. 8. That example was using multiple overlays to build an image. But you don't need to spend time doing that. You can quickly create a blank canvas and just add something like a chick and an egg from the butterfly menu. Then save it to your computer. 9. You can also use PicMonkey and other image editors to add a photo you’ve taken to a blank canvas, the way I did for the image at top. In PicMonkey, this is found via the Overlay/Butterfly where it says “Your Own”, just above General. You need to know where the image is on your computer to do this. I began with a blank white canvas, added my own photograph via the butterfly, added text, then popped some bunting underneath. I changed the colour of the bunting using the eyedropper tool so it matched two colours in my photo. Several online spaces offer free images that we’re encouraged to make use of. It’s important to find out all you can about that offer. Some sites will tell you in plain English that the images are free to use in various projects, so long as you give attribution (usually by linking to that website.) Some sites will even allow you to use an image with no attribution. Some sites offer images that have a clear Creative Commons license. The Creative Commons website has lots of information, including this page about sourcing CC licensed materials. The main thing to remember is not everything is free, and not everything is licensed for you to use. Sometimes, because of this, people just decide it’s a whole lot easier to make or take their own images and use them. If you do decide to use someone else’s images, here are some sites I have used. I MAKE NO GUARANTEES OF SUITABILITY or anything else! Teachers and parents always need to supervise kids carefully on the internet, where websites can change very quickly. Check each site’s terms of service as some don’t allow use by people under a certain age. Be sure to also check each individual image for its license and how you may use it. Flickr is a huge website of images uploaded by users. You can filter with Creative Commons, but it’s always worth double-checking as people can change the license they put on one of their images. PhotoPin includes image attribution in the code it gives you making it ideal for blogs. morgueFile has free searchable images with no attribution required. However, lots of people think it’s a good idea to always give any image credit as courtesy. Be careful as morgueFile also has other tabs that lead to paid sites. Pixabay has searchable free photos, vectors and art illustrations. 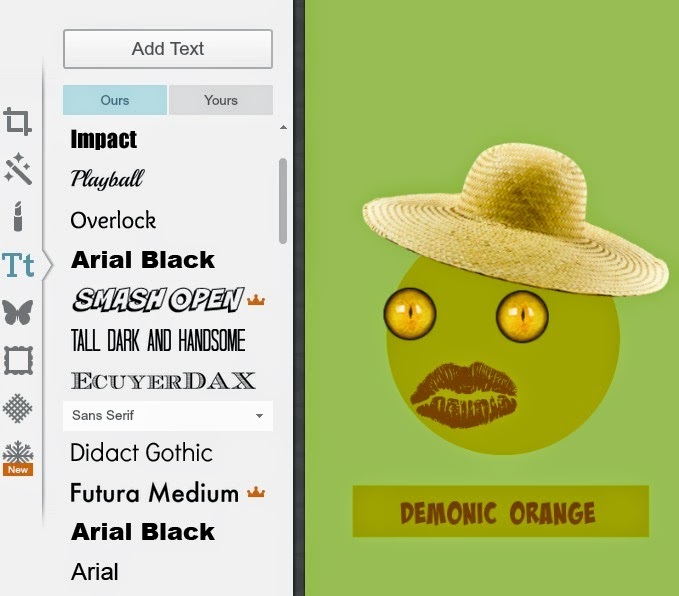 PicMonkey is an Image editor and it includes clipart. It is free for some things then you can pay for a premium subscription. Ribbet is an image editor that includes clipart. It’s free for certain things. 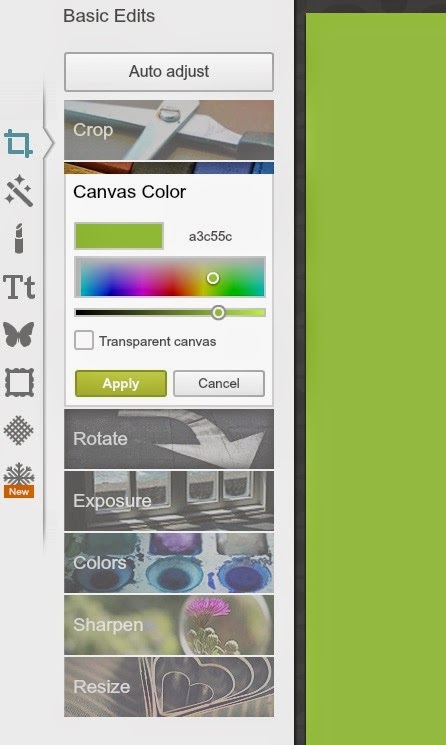 Canva is an image editor. It offers images, some of which are free. It also has a wonderful Design School which offers tutorials in design. If you do decide to use a camera or i-device to take your own photographs, or you want to build an image from scratch with a blank canvas, try one of the three image editors I mentioned just above. PicMonkey, Ribbet and Canva not only offer a blank canvas of your required dimensions, you can also use them to make changes to your photographs by editing them. Editing might mean applying a special effect, adding an overlay or stamp or clipart, adding text or a frame etc. You can also start an image in one editor and move to another, the way I mentioned in Book Chook Favourites - Online Image Editors. Creating our own images isn’t the quickest or easiest creative activity. But once you understand the basics, it’s not only fun but very satisfying. You might also like to read iPad Photography Ideas for Kids, Ways Kids Can Create Images with iPad, and Creative iPad Photo Apps.